What would possess a bunch of kids in the 1970s (myself included) to build two makeshift ramps, hop on their bikes and try to jump over a row of their friends lying on the ground? All the answers can be found in Being Evel. Before Robert Craig Knievel became the motorcycle daredevil named “Evel,” he was a hell raiser/insurance salesman/huckster in Butte, Montana. Blessed with a gift for self promotion, he rode it and a slew of Harley Davidsons on a path to fame, fortune, and inevitable burnout. Regardless, director Daniel Junge (Oscar winner for the 2012 documentary short Saving Face) gets behind the myth in fascinating, informative and entertaining fashion. Knievel’s life truly is a classic American success story, and Junge gives us a wide-angled look. From setting sales records at his insurance company, to actually convincing the Czech national hockey team to come play his semi-pro squad in Montana, Knievel moved through life with an intentional swagger a good-sized shoulder chip. After conning his way into a Vegas motorcycle jump, he caught the eye of ABC’s Wide World of Sports, and a legend was born (along with a line of some of the greatest action figures ever made). Junge’s presentation is stylish, and his archival footage enlightening, getting us close to team Knievel as he bought into the immense hype leading to a 1974 attempt at jumping over Utah’s Snake River Canyon in his custom-made rocket powered “Skycycle.” In short, Knievel became a world class SOB, a horrible husband and a distant father, all while representing true American freedom to legions of fans. Knoxville’s frequent presence does become a bit tiresome, though Knievel’s weighty influence on his Jackass antics, as well as today’s entire action sports industry, is rightly noted. 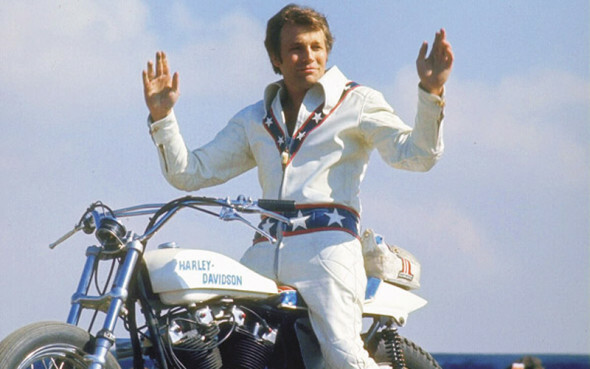 Fascinating not just for the well-rounded treatment of its subject, but also for a glimpse into the disillusioned era that created him, Being Evel is a satisfying flight.